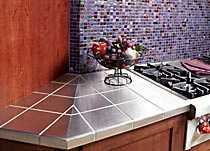 The kitchen countertop of a home is one of the most used items in the home. This makes choosing the right countertop for your home a very important decision as the type of countertop that you choose will determine how often you will have to do maintenance on the countertop and how long it will be before the countertop will need to be replaced. There are many green countertops that can be chosen for placement in the home that will provide a great value for the home as well as being an attractive addition. When choosing a green countertop for your home, the first thing that must be considered is how durable the countertop will be over the long run. You do not want to spend a great deal of money on a countertop that will only last for a few years before having to be replaced. It is important to choose a countertop material that will be able to withstand the abuse that the homeowners subject the countertop each day when cooking, cleaning, and performing other kitchen duties. Another important aspect of a green countertop that must be considered when choosing a countertop for the home is how stain resistant the countertop will be. Some materials are porous and will stain more easily than other types of countertops, which will require the countertop to be sealed under a thick layer of sealant to protect the countertop. Resealing the countertop will have to be accomplished ever few years to ensure that the countertop remains protected from outside elements. Many homeowners will want to choose a green countertop that is heat resistant so that the countertop will not be damaged if something hot has been placed on the surface of the countertop. Countertops made out of recycled metal or recycled glass are some of the best types of countertops for heat resistance, although placing a hot pan or pot directly on the surface of the countertop is never recommended. In order to keep the countertop looking beautiful and new, it should be protected from the heat of hot objects by placing a pot holder or place mat between the surface of the countertop and the hot object. In order to be sure that the countertop is as green as it can be, be sure to look for materials that have been recycled or obtained in a green way. In some cases, countertops that are advertised as green creates used just as much energy in obtaining the raw materials and creating the countertop as countertops that are not considered to be green. The materials used in the countertop should not require a great deal of processing to create the finished product as the energy used to process the materials makes the countertop less green.